Act I: 1959 – From left: Thomas Derrah, Delance Minifee, and Michael Kay in a scene from the SpeakEasy Stage Company production of Clybourne Park, running now thru April 6 at the Calderwood Pavilion at the Boston Center for the Arts, 527 Tremont St., in Boston’s South End. Photo: Craig Bailey/Perspective Photo. 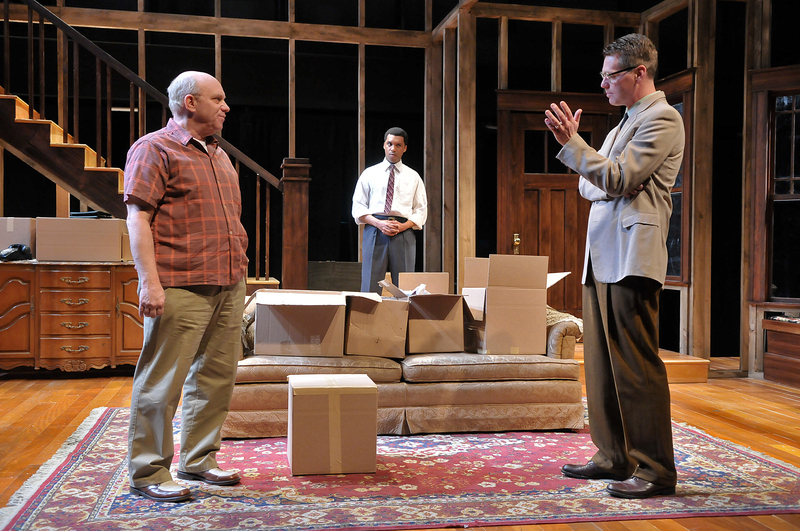 BOSTON — Bruce Norris’ Tony and Pulitzer Prize-winning drama “Clybourne Park” is a cleverly, carefully constructed play that looks at a very important issue from two very different angles. “Clybourne Park” is actually two different plays set in the same house in a Chicago neighborhood, the first set in 1959, the second in 2009. In both cases, the answer is race. But in each, the question is different. In the Speakeasy Stage Company production in the Calderwood Pavilion at the Boston Center for the Arts which ends Saturday — hurry please — Director M. Bevin O’Gara ably guides a strong emsemble cast through Norris’ staccato, rapid-fire dialogue.. In the first act, Norris leaves clues like a scattered trail of bread crumbs foretelling what may happen 50 years later. One clue — watch the trunk. In the first act, an African-American family is about to become to become the first family to move into the neighborhood. It is the Younger family, the family at the heart of Lorraine Hansberry’s classic, “A Raisin in the Sun,” itself enjoying a remarkable production a couple of miles away at the BU Theatre. In Act 2, the issue is gentrification, when the motives of a a white couple ( Michael Kaye and Philana Mia) moving into the still largely African-American neighborhood are questioned. In Act 1, Russ (Thomas Derrah) and his loving wife Bev (Kerry Dowling, capably replacing Paula Plum for the last week of the run) are packing their possessions for their imminent move after many years in the home. Derrah is consumed by rage at others — and himself — at the tragic death of his death of his son, and it sets off a fiery debate with his neighbors over whether he owes them any consideration over whom he sells to, and whether the entrance of a black family will set into motion a cataclysmic chain of events that will forever change the neighborhood — not for the good. In this case, Norris notes that racial progress — and the integration of a neighborhood — can sometimes turn on motives that are less than pure. Norris delights in putting his characters in contrasting positions between in Act 1 and Act 2. In Act 1, Marvelyn McFarlane is Francine, Russ and Bev’s deferring African-American housekeeper, who along with husband Albert (DeLance Minifee) is put in a very awkward situation when an ugly tug of war breaks out over whether an African-American family should live in Clybourne Park, and whether they would be happy there. as is Kaye, in the first act as resident Karl Lindner, who leans on Russ and Bev to rescind the sale of their home, and in the second act as the would-be homeowner defending his motives in knocking down the home and ignoring height restrictions in building his new home. Norris doesn’t mind helping himself to a heaping helping of irony at times; in the first act, Kaye as Karl opines that because blacks don’t like to ski, how could they be comfortable with those that do? In the second act, Kaye as Steve is mocked for not being able to ski. In the second act, words and meanings become very important — rac-ism vs. rac-ist — and a racially-based joke stirs the pot — and the discussion. Kudos to the Speakeasy crew for transforming Cristina Todesco’s skeletal set 50 years forward in 15 quick minutes.